Well, it’s time for Round Two of what the Stanley Cup has been up to with the Chicago Blackhawks. The last time we took a moment to catch up with the Cup, it had been doing the morning show circuit, visiting a children’s hospital, meeting its meaty Doppelgänger, meeting David Letterman, and hitting summer concerts with Jimmy Buffett and Rush! That’s a lot for Lord Stanley’s Cup. However, a few more players have gotten their turn to take the Cup out for a day, and if there’s one thing the Blackhawks know it’s how to party and have a good time. Blackhawks alternate captain, and current Captain Handsome, Patrick Sharp took Lord Stanley’s Cup down to the South Side to enjoy some baseball at US Cellular Field (we still call it Comiskey). Of course, Coach Quenneville brought the Cup to Wrigley Field to get the crowd jumping and to make sure that the Sox and the Cubs got equal amounts of love from the Blackhawks. 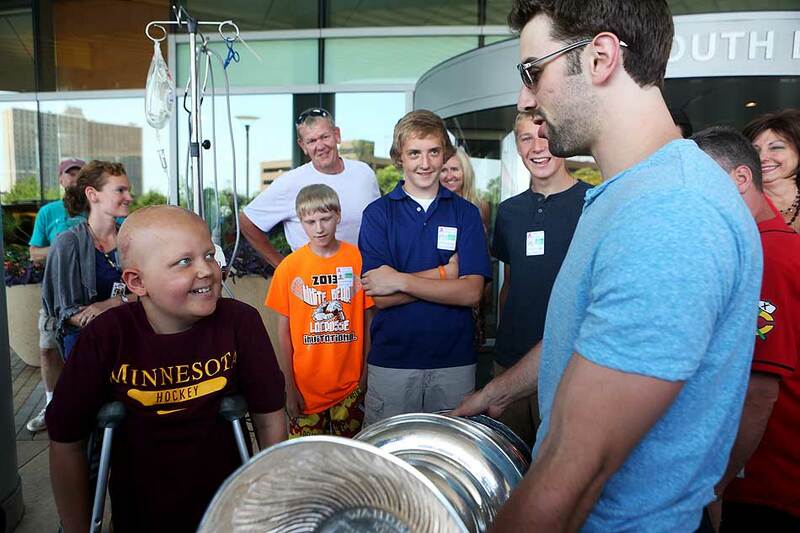 Nick Leddy took the Cup to Minnesota to show Wild fans what a real hockey team can accomplish. 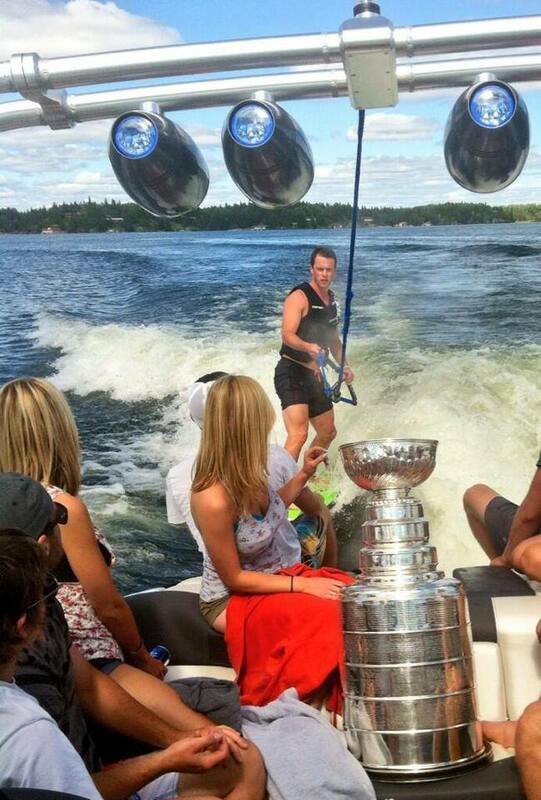 The Stanley Cup had quite a day in Minnesota with Leddy. Let’s take a dip, Cup! 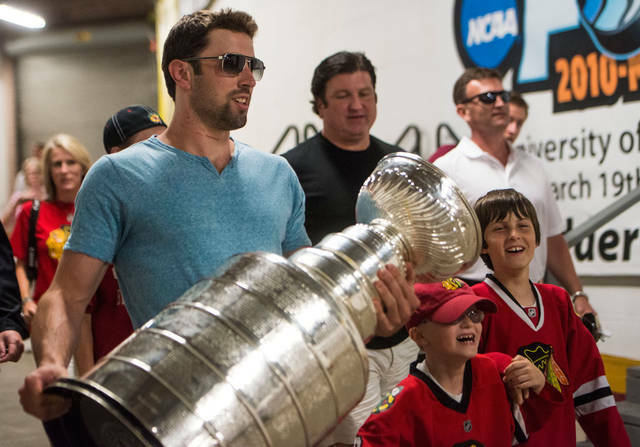 Of course, in the tradition of the Blackhawks being spectacular guys, Leddy took the Cup to brighten the day of patients at a local children’s hospital. Just out brightening the day. 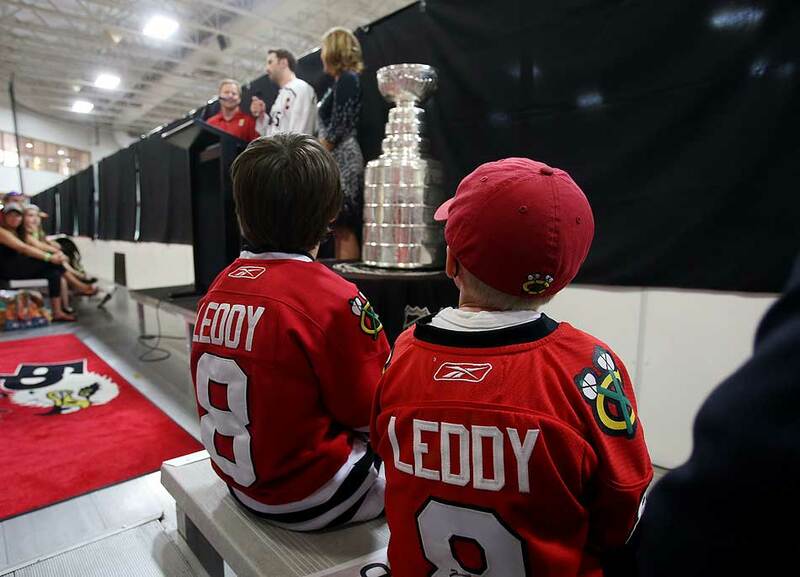 Everywhere Leddy went, his fans and fans of the Cup were right at his heels. 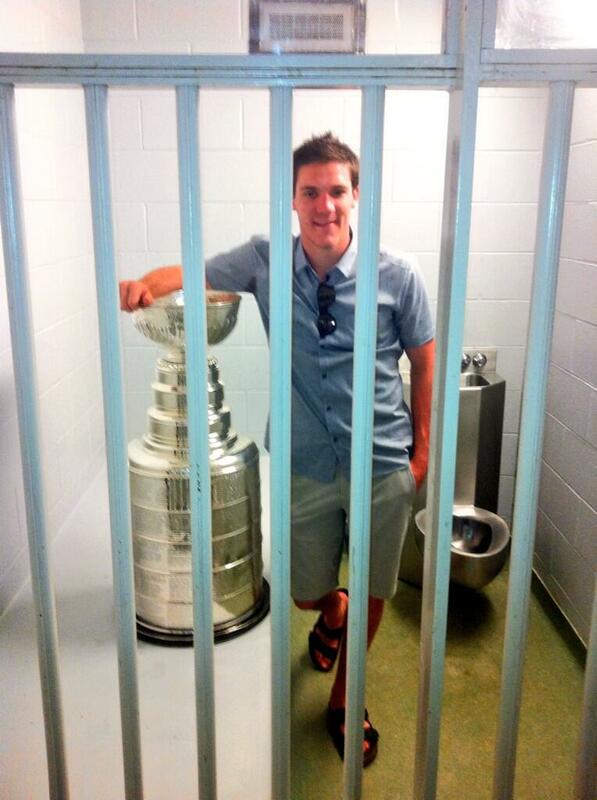 Andrew Shaw also got a day with the Stanley Cup. Naturally, he ended up sporting it behind bars because if you’re going to be the Blackhawks bad boy, you better do it right! 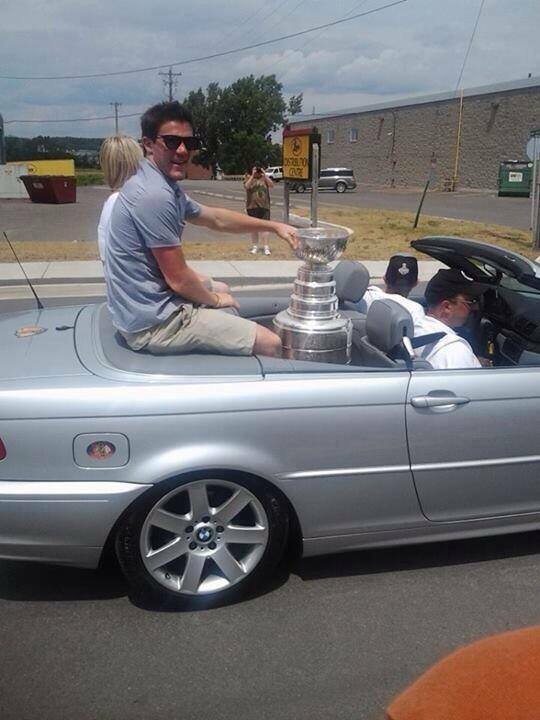 He also cruised around his hometown in Ontario with the Cup like a total stud. 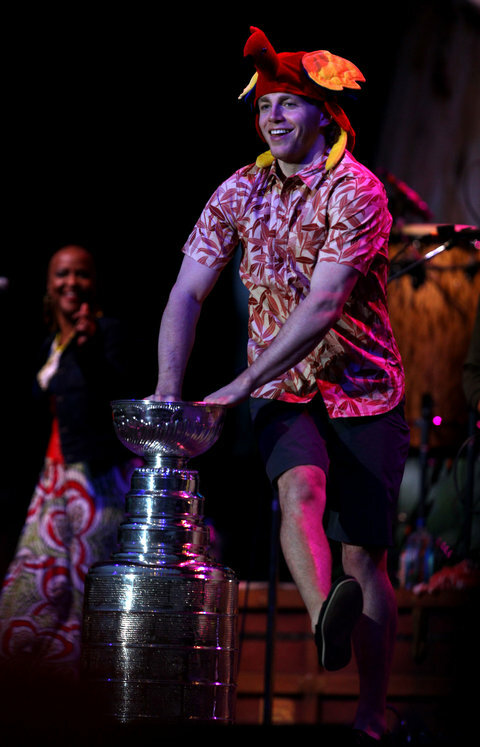 Captain Toews got his day with the cup and after it had been to a Rush concert, a Jimmy Buffett concert, a parade, and two baseball games, among other activities, Toews took it out water skiing. 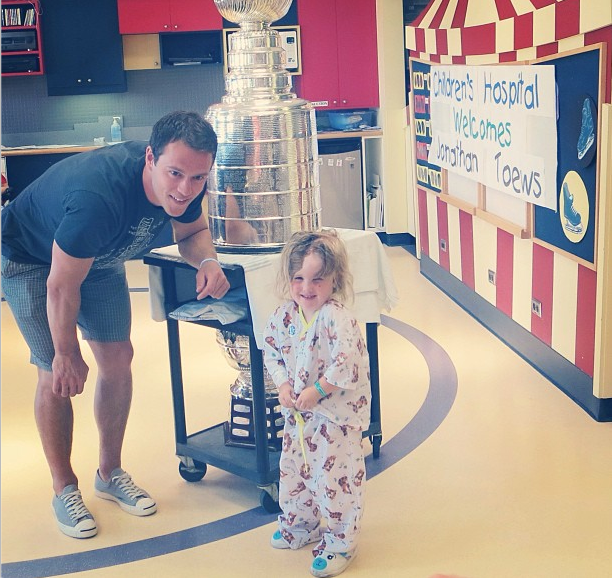 Like Nick Leddy and Coach Q, Jonathan Toews took the Cup to a children’s hospital and not only brightened the day of the children but also warmed all of the hearts ever. That burning in your chest is your heart radiating love. The Blackhawks are out and about with the Stanley Cup, and you could see them bouncing around! 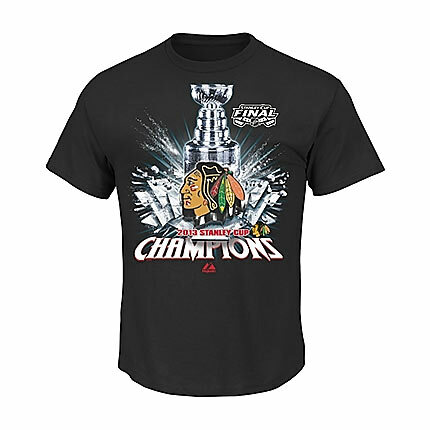 Make sure you let them know that you love the Blackhawks rule with great attire from Clark Street Sports! Find this and a large variety of Blackhawks Stanley Cups shirts on our website (http://tinyurl.com/mmqtv77) and keep looking good on the chance that you become a part of the Stanley Cup’s infinite summer vacation. Just like the Blackhawks first game during the Western Conference Quarterfinals, the Hawks got of to a slow start at entered the third period tied 1-1 at home. Unlike that series, the Blackhawks showed why they were the winner of the presidents trophy and scored three third period goals to give them a 4-1 victory over the Detroit Red Wings. Just as they have all season long, the Hawks received contributions from both their forwards: (Patrick Sharp (goal and 2 assists), Marian Hossa (goal), Marcus Kruger (goal), Jonathan Toews (assist), Patrick Kane (assist), Daniel Carcillo (assist)); defensemen (Johnny Oduya (game winning goal), Niklas Hjalmarsson (assist), Nick Leddy (assist)); and goaltender (Corey Crawford stoped 20 of 21 shots). Chicago will continue their series Western Conference Semifinals Series Saturday noon at the UC as the Hawks look to take a 2-0 series lead to Detroit. The Chicago Blackhawks are off to the best start in the history of the franchise after defeating the Detroit Red Wings 2-1 last night at the United Center. Led by Goaltender (and the NHL’s 2nd Star of the Week) Corey Crawford, Chicago has received contributions from everyone on the roster number in the early parts of the season. In addition to Crawford’s 29 saves, the Blackhawks had goals scored by defensemen Duncan Keith and Nick Leddy last night. Chicago Sports fans, the Blackhawks will now begin a 6 game road trip, however, following this current road trip, Chicago will play 10 of their next 12 games at the United Center. Blackhawks fans, remember to pickup all your favorite Chicago Blackhawks Merchandise at one of our many Chicagoland locations or online throughout the NHL Season.